The rapidly expanding retailer holds out the promise of "good middle class jobs" for the national capital. 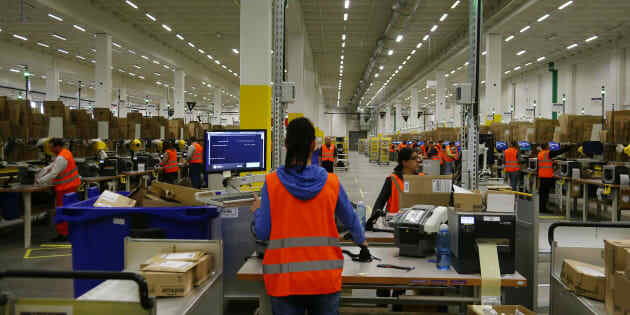 Workers handle items for delivery at an Amazon distribution center near Berlin, Germany, Nov. 28, 2013. Amazon is planning to build a one million-square-foot distribution centre in Ottawa's east end, according to news reports. Update (July 10, 2018, 11:39 a.m.): Amazon has announced its fulfillment centre, which will be located in the east-end suburb of Orleans, is expected to create some 600 full-time jobs. The warehouse will be the company's eighth in Canada. Others include locations in Ontario, British Columbia, Alberta, and a technology hub in Vancouver that is undergoing an expansion. Amazon is beginning work on a massive distribution centre in Ottawa that is expected to bring 1,000 jobs to the area, according to local news reports. Amazon is not officially confirming its plans for Ottawa, but two members of Parliament confirmed the plans to CBC Ottawa. "It will employ approximately 1,000 people, good middle class jobs, and it's going to be a transportation hub," Orleans MP Andrew Leslie told CBC. "We have been working with Amazon for a couple of months now and we are just thrilled that it's all coming to maturation." According to CTV News in Ottawa, it will be the largest industrial building ever built in the city, with one million square feet of space sitting on a 96-acre lot near Boundary Road and Highway 417 in the city's east end. That location gives Amazon easy access not only to Ottawa but to the Montreal market, 180 kilometres to the east along Hwy. 417. Construction on the building hasn't yet begun, but trees on the lot have been removed. Jeff Bezos Makes $12B In A Day After Hiking Amazon Prime Price In U.S.
Ottawa was among the cities that vied for Amazon's second headquarters, but was cut from the list of finalists. Toronto is the only Canadian city among 20 North American finalists. Amazon has grown to be the world's largest retailer, and as of Friday morning it was the world's second-largest company by market value, worth US$787 billion, compared to US$931 billion for the world's largest company, Apple.